How stressful is this street to bike on? You can’t tell from a photo. Image: Stewart Eastep. Since its founding 50 years ago, the top U.S. agency for investigating transportation injuries had been suprisingly quiet about a phenomenon that’s behind 30 percent of U.S. traffic fatalities. Avoided the subject until this month, that is. 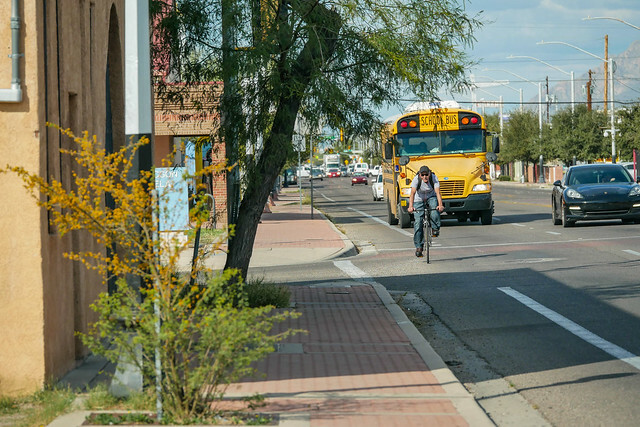 Though people walking and biking have the most to lose in any conversation about safety, many advocates of low-car transportation also overlook the importance of traffic speed. Bike lanes like this one might be quite comfortable on a low-speed street. In this case, not so much. 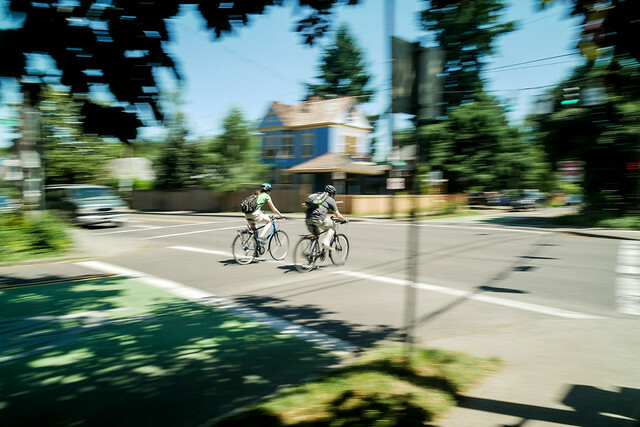 Even biking advocates can be guilty of overlooking speed as a factor in bike infrastructure. Slower-moving cars don’t photograph as nicely as a green-painted protected bike lane, but they’re just as important to whether most people feel comfortable biking on a road — even when a new bike lane isn’t in the works. In the new PlacesForBikes Bike Network Analysis of various U.S. cities, we always look at two factors when calculating the “stress level” of biking on a given street: the roadway design (auto lane count, bike lane width, separation type, and the presence of parking) and the posted speed limit. 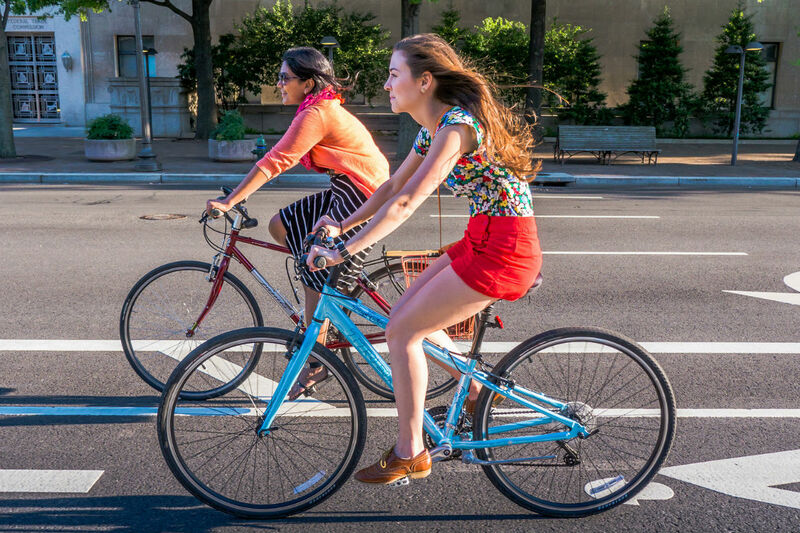 That’s based on work by Northeastern University’s Peter Furth, who concluded that auto speeds interact with bikeway design to greatly affect people’s willingness to bike on a street. Neighborhood bikeways make biking comfortable on side streets simply by slowing and reducing auto traffic. What can biking believers inside and outside of government do to reduce dangerously fast driving? One way might be to pay at least as much attention to too-wide auto lanes, which increase people’s “natural” driving speed, as to too-narrow bike lanes. Another might be to support four-lanes-to-three road redesigns even when the changes don’t include bike lanes, because those designs prevent bad drivers from weaving between lanes in order to get to the next red light more quickly. On heavily signalized streets, cities could create green waves that give continuous green lights at 20 mph or 12 mph, making it pointless to drive at a lethal speed. And as the NTSB report recommends, states could give cities the right to use safety cameras — already in wide use on the dramatically safer streets of Europe — to automatically issue fines to scafflaws who ignore speeding laws. The NTSB report also questions the longstanding “rule of thumb” that speed limits should be set based on the natural speed at which 85 percent of people drive. The NTSB recommends also considering other factors, including recent collision and fatality rates.